Wonder Woman: The Circle collected volume begins with a gushing review from Mercedes Lackey which describes this book as possibly the greatest depiction of the Amazonian woman that we've ever had. I was quite willing to except this as I had never really read a Wonder Woman comic before. Though I believe Linda Carter is still the best Wonder Woman! I didn't really know what to expect when I picked up this book but I was pleasantly surprised. Author Gail Simone offers a take on Wonder Woman that many before have attempted but never really achieved. Whether she is fighting gorillas enhanced by Gorrila Grodd, enchanced Nazis or a mad member of the Green Lantern Corps, we are given a description of how Wonder Woman thinks when she is fighting. This is something that isn't used for characters like Wonder Woman often and it makes the characters instantly more relatable because we get a real look into how their mind works. In fact, I only know of two fictional character who are both warriors where the creators have decided to allow the audience to get a real look into their minds and they are Wonder Woman and Leela from the Doctor Who universe thanks to the audiobooks from Big Finish Productions. This is Wonder Woman presented to us in a way that is clearer than ever before! Also Simone cleverly breaks brand new ground with the depiction of the lasso of truth. The scene where she uses it to enter a 'truth scape' with Captain Nazi a repugnant character throughout the beginning of the book. But what the author cleverly does is uses a couple of panels to really make the readers feel sympathy for this character. This suggests that Simone might not only give us a great Wonder Woman but perhaps one of the best depiction's of the character ever. Even though I did enjoy the book over all, I did find it a little flat. The first story was a good read and sees a group of enhanced Nazi's invade Wonder Woman's home of Paradise Island before a group of warriors who tried to stop Diana being born tries to kill her. But, we don't learn anything particularly new about her origins and I couldn't help but be a bit disappointed about this. The second story, Expatriate, gives us more from Simone's wonderful depiction of the character but the story is ultimately just the same kind of superhero story that is featured in many comics and doesn't rise any further than the bar that has already been set by other characters and writers. What it is good in this story is that Simone also develops Etta Candy. What is particularly odd about this story is that it gives Wonder Woman a new origin. While there is nothing new about this, we know that Superman is the last survivor from the planet Krypton and that Batman saw his parents killed. Lots of authors before Simone have strived to give Wonder Woman a good origin story, Simone tells us that she was made as a clay baby who became real after a spell is used and there is little in the way of dialogue to explain to us why the queen's guards would be mad about this. Gail Simone also furthers Wonder Woman's relationship with Tom 'Nemesis' Tresser. There is nothing really wrong with that, I think it is only fair that a female writer like Simone should be the one to give her a boyfriend and with a body like Tresser's Wonder Woman has obviously done well for herself! But I hope that the adventure side of the stories take more a drivers seat rather than her love life. Overall this is an enjoyable book with solid writing from Gail Simone and some good bubbly art from Terry Dodson, someone whose art I don't usually enjoy. But if there is one thing to take away from The Circle, it is that Wonder Woman is in very safe hands! 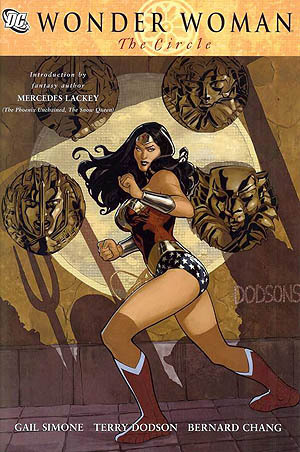 WONDER WOMAN: THE CIRCLE, WRITTEN BY GAIL SIMONE WITH ART FROM TERRY DODSON AND BERNARD CHANG WAS RELEASED IN A COLLECTED VOLUME IN 2008.